Megalencephaly, polymicrogyria, polydactyly, and hydrocephalus (MPPH) syndrome has been recently recognized and is very rare. Each case reported so far has demonstrated hydrocephalus to varying degrees. We report an infant with MPPH syndrome, but lacking frank hydrocephalus. The additional finding of an abnormally elongated pituitary infundibulum has not been described in this syndrome and, along with the presence of a regressing cystic cavum septum pellucidum, suggests that chronic underlying hydrocephalus may have been present. Megalencephaly, polymicrogyria, polydactyly, and hydrocephalus (MPPH) syndrome was first described in 2004, with only 9 cases reported so far; hence, the prevalence has not yet been determined.1,2 Hydrocephalus has been considered a mandatory component of this syndrome.1—4 We report a patient with macrocephaly, polymicrogyria, and polydactyly, but without overt hydrocephalus. We also report an elongated pituitary infundibulum along with a regressing cystic cavum septum pellucidum (CSP); cystic CSP has been described previously in MPPH, but without reports of regression.2,5,6 We discuss how to distinguish MPPH from other syndromes presenting with polymicrogyria or megalencephaly. A 1-day-old boy was born to a healthy nonconsanguineous family at 39-weeks’ gestation. Findings of prenatal sonography had suggested mildly dilated lateral and third ventricles, but with an otherwise unremarkable prenatal follow-up. After initially low Apgar scores but subsequent improvement with bag-mask ventilation, the patient was admitted to the neonatal intensive care unit with normal breathing. On physical examination, he was macrocephalic (head circumference >3.5 SDs above normal) with normal body length and weight, but with bilateral sixth digits along the ulnar aspects of the hands on plain films (Fig 1A). He had low-set ears, a high arching palate without cleft or cyst, and esotropia. No hypotonia/hypertonia was present, and deep tendon reflexes were normal. Results of blood biochemistry, cultures, and investigations for metabolic disease were unremarkable. Findings of cytogenetic analysis were unrevealing. Kidney and cardiac ultrasound findings were unremarkable. A−C, A neonate with macrocephaly and a sixth digit on plain film (arrow, A), who underwent MR imaging demonstrating diffuse polymicrogyria on T2WI (arrows, B and C). A prominent cystic CSP bows the cyst walls laterally (asterisk, C). D, The temporal horns are not overtly dilated on T2WI images (not shown), though the pituitary infundibulum is elongated (arrow), without dilated anterior third ventricular recesses, arguing against frank hydrocephalus (dotted arrows). E, At 8 months of age, the cystic CSP becomes much smaller (asterisk), but with enlarged subarachnoid spaces over the cerebral convexities. The arrows denote polymicrogyria in the midst of progressing myelination. F, The infundibulum is even more difficult to visualize, whereas the brain stem appears slightly small. Cranial sonography was then performed, which suggested subtle lateral ventricular dilation. Thereafter, MR imaging demonstrated diffuse polymicrogyria bilaterally, favoring the posterior frontal lobes and perisylvian regions (Fig 1B, -C). Additional findings included an elongated pituitary infundibulum without other sellar abnormalities. A cystic CSP was present, measuring 1.5-cm maximum transverse diameter (Fig 1C). The myelination pattern appeared normal. There was mild colpocephaly of the lateral ventricles, but without enlargement of the anterior recesses of the third ventricle or of the temporal horns of the lateral ventricles (Fig 1D). The midbrain and corpus callosum appeared normal. At 7 months, the patient developed seizures, which were controlled by medication. An electroencephalogram indicated seizure activity in the right occipital region spreading to the temporal lobe. Follow-up MR imaging at 8 months age demonstrated that the pituitary stalk remained elongated and even more difficult to visualize, still without overt ventricular enlargement (Fig 1E, -F). The brain- stem at this point appeared somewhat small, but not frankly hypoplastic. The cystic CSP decreased to 7 mm, whereas the subarachnoid spaces over the convexities had increased. There were no overt abnormalities in myelination, with appropriate myelination for age of the callosal genu and splenium on T2-weighted images (T2WI), though there was no repeat MR imaging in the second year of life to exclude entirely abnormalities in myelination. At this point, the patient has been followed for more than 1 year and has reached age-appropriate developmental milestones. MPPH syndrome was originally described in 2004 in 5 patients with megalencephaly, polymicrogyria, polydactyly, and hydrocephalus, along with severe psychomotor retardation, blindness, hypotonia, epilepsy, and facial dysmorphism.1 Subsequent reports have described phenotypic variation with facial dysmorphism of varying degrees (present in our patient); syndactyly, callosal, and midbrain abnormalities have also been described but were not present in our patient, who also had a later onset of epilepsy.1—4 Hence, he may have a milder phenotypic variant, given his later onset of seizures and appropriate psychomotor development to this point. The finding of colpocephaly without overt hydrocephalus raises the question as to whether frank hydrocephalus is mandatory in MPPH. 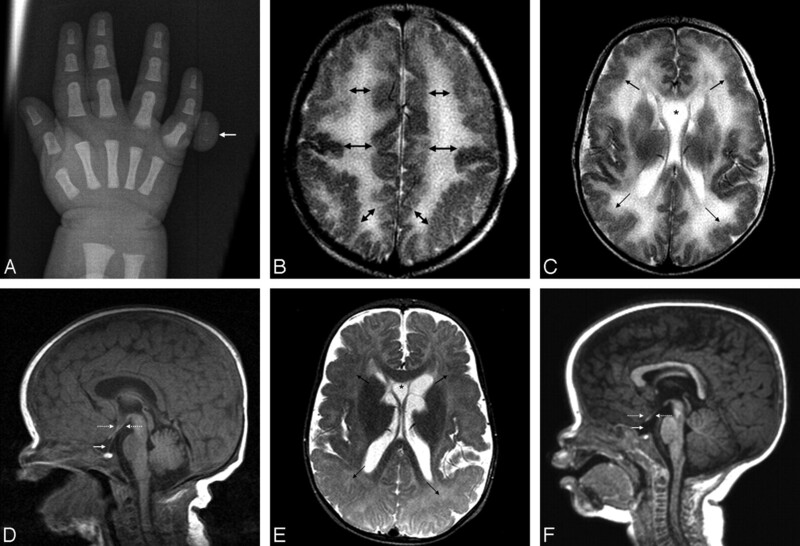 In the small number of patients reported with MPPH, hydrocephalus has been consistently described, along with macrocephaly, polymicrogyria, and polydactyly. The lack of definite hydrocephalus in our patient also suggests that he represents a milder variant. However, the infundibular elongation raises the question of chronic underlying hydrocephalus, possibly extending from an enlarged suprasellar cistern; in such a situation, the ventricles may not dilate due to the elasticity of the infant skull with extracerebral communication of the hydrocephalus. However, it is difficult to discern whether overt hydrocephalus will ultimately develop without years of follow-up. We noted 2 MR imaging findings in our patient that, to our knowledge, have not been described previously in MPPH syndrome: pituitary infundibular elongation and decreasing size of a cystic CSP. The elongation of the infundibulum is nonspecific and again could relate to chronic low-level increased intracranial pressure. Regarding the cystic CSP, some reports in patients without MPPH have described intermittent hydrocephalus from its enlargement, with improvement or resolution of symptoms following treatment.6 In MPPH syndrome, a cystic CSP has been described in all except 1 patient, a higher occurrence rate than that in the general infant population of 10%–40%.2,5,7,8 Hence, the cystic CSP in our patient could have related to chronic low-level hydrocephalus, with a decreased size from extraventricular decompression outside the ventricles, because the subarachnoid spaces along the convexities were more prominent on follow-up MR imaging. However, we cannot exclude the possibility that the cystic CSP is a developmental defect associated with MPPH. No genetic alterations in MPPH have been found, and accordingly, our patient had no chromosomal abnormality. However, we did not perform a high-resolution cytogenetic examination, a potential limitation of this report. The presence of congenital metabolic disorders was largely excluded by negative findings on an extensive work-up via laboratory screening. Paper previously presented at: Annual Meeting of the American Society of Neuroradiology and the American Society of Pediatric Neuroradiology, June 3, 2008; New Orleans, La. Accepted after revision January 27, 2009. Cerebral cortex expansion and folding: what have we learned?